The beginning of the Dargle Road where the injured man was found early on Tuesday morning. GARDAÍ ARE APPEALING for witnesses to an incident in Co Wicklow which left a 56-year-old man seriously injured. On Tuesday morning at 5.55am, the man was discovered on the Dargle Road, Bray, with what gardaí describe as “significant injuries”. He is currently in a critical condition in St Vincent’s University Hospital. The man is described as 5ft 8in and of thin build. He was wearing a wine coloured jacket, a black t-shirt and dark tracksuit bottoms when he was found. Gardaí have identified the man but are anxious to establish how these injuries occurred. Anyone who saw this man between 11.35pm on Monday and 5.55am on Tuesday this week to contact Bray Garda Station on 01 6665300, the Garda Confidential Telephone Line on 1800 666 111 or any garda station. 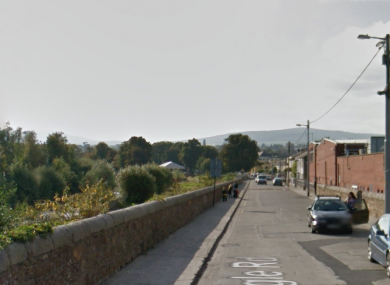 Email “Man (56) found with serious injuries on Bray road”. Feedback on “Man (56) found with serious injuries on Bray road”.